i met gordon ownby a few years back. he and his wife bought one of my pieces at a local art fair down the street....and thankfully, they kept coming back. some of my best friends are my collectors. and i suppose i gravitate toward these people cuz they "get" my work, so it's no surprise, really. but, i eventually found out gordon was also an artist (humble guy, he is). a photographer to be exact. he shoots documentarian style but has recently branched out to more posed-portraiture. so, when he asked me to be one of his 'subjects' for his current project (shooting artists in their environments).....i jumped at the chance. i've had webcams in my studio for almost 9 years, but have little evidence of the moments caught during that time. 'what an honor,' i thought....to be captured and archived like that. being the last of 5 children, i guess my desire for attention finally kicked in?!! so, we began our day at 8:30 am (crack o'dawn in MY world) by driving to nearby eagle rock for a 'junk walk.' gordon set me on my way, telling me to do whatever it is that i do.....so, i did. i put on my radio, donned my sunglasses, set the walking pace and grabbed whatever i deemed worthy. (and go figure, an undetermined metal object i picked up found its way into one of my current pieces later that day) it was awkward at first, but i soon lost myself in the moment, like i always do. i was just doing my job, after all. i quickly realized eagle rock is FULL of grit and i've neglected it way too long. every once in awhile i would catch gordon in the corner of my eye, either racing ahead of me or 'heeling,' in search of that perfect shot. 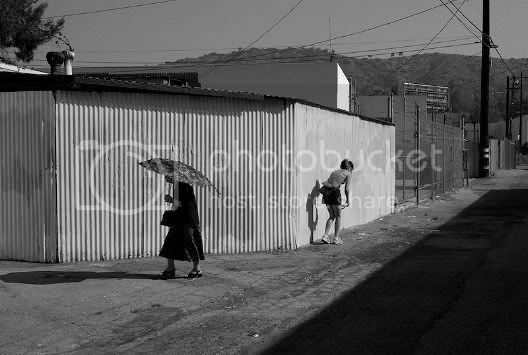 the 2nd image was taken in an alley while a sweet old lady passed by me with her sun shielding umbrella. later, gordon and i joked that you just can't PLAN shots like that....DeFiNiTeLY the money shot!!! 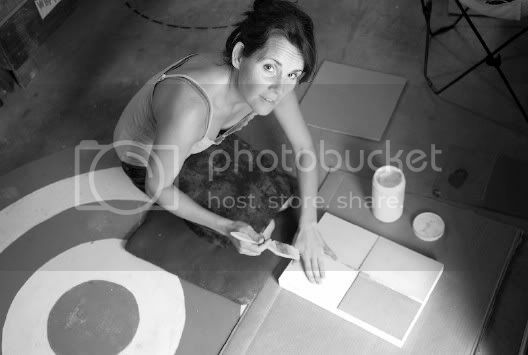 Those really are nice photos, and black and white works so well with portraits. you're so right...color just gets in the way sometimes. i love the contrasty-nous of b/w. they are both beautiful photos. i wish i had some good photos of myself working. it is nice to capture that moment for posterity....i say, get a tripod, set your camera timer, and go for it! i suppose you're right. and i already have a tripod so there isn't any excuse. I LOVE that one with the old lady in the foreground! isn't she sweet? we almost ran into each other, actually!!! you are there baby. and to think i knew you before you made it. *blush* you're so suh-sweet pammy!!! these portraits are amazing. you are AMAZING! hehe. that second shot is priceless. that's ME in 40 years!!! That photo is priceless. Both photos are art. I love shooting in b&w. Gobs of thanks for the write-up and comments on my photos of Baby Smith. They are proof that a free spirit can barely be captured --and then only for 1/250th of a second.